New York University, which has been rocked by revelations of providing multi-million dollar residences, forgivable mortgages, and sweet-deal, in-house financing for luxurious vacation homes to an elite group of staff and faculty, is now linked to the Hillary and Bill Clinton cash-by-the-truckload scandal. According to an analysis by the Washington Post, since leaving the White House in January 2001, Bill Clinton was paid $104.9 million for speaking fees through January 2013 when Hillary stepped down as Secretary of State. In addition, their nonprofit, the Clinton Foundation, has reported over $2 billion in donations from corporations and foreign governments around the world. In May, Hillary released a new financial disclosure form in conjunction with her candidacy for President. That form covered the period from January 2014 through May of this year, showing that the Clintons earned an additional $25 million for speeches. On May 21 of this year, the Clinton Foundation revealed that there was an additional $26.4 million in speaking fees that had been paid to Bill, Hillary and Chelsea Clinton that had not previously been broken out to the public because the fees had been donated to the Clinton Foundation. The payments came from universities, foreign sources, and corporations. The Foundation said the funds had previously been reported to the IRS as “revenue” rather than donations and that is why the donors’ names had not previously been reported. Two speeches given by Bill Clinton at NYU Commencements are missing from both Hillary’s financial disclosures for herself and Bill, as well as missing from the Clinton Foundation’s disclosures. One of those speeches was highly controversial and not likely to be a missed reporting detail. On May 19, 2014, the New York Times dropped a front-page bombshell on the already disgusted faculty at NYU which had given its President, John Sexton, a no-confidence vote at five of its schools in 2013. The Times reported that NYU’s campus in Abu Dhabi had been built on the backs of abused immigrant laborers. The Times reported that “men described having to work 11 or 12 hours a day, six or seven days a week,” had their passports taken, and some men “lived in squalor, 15 men to a room.” The workers also reported having to pay up to a year’s wages in recruitment fees to get their jobs and, despite NYU’s statement on labor standards, contractors had not reimbursed the fees. Striking workers had been beaten, jailed and deported. “The recent controversy in the American press over the question of whether the labor conditions and living conditions of people who worked to build this campus actually complied with the standards that NYU and its Abu Dhabi partners articulated. It’s dominated the coverage. I wish the coverage this week had been about you. About who you are, where you’re from, what you’ve done. This astonishing experiment. “But, it does offer NYU, and you, the opportunity to address in concrete, real, flesh and blood form, one of the representative issues of equality and identity in the 21st Century. We all know that the treatment of immigrant labor all across the world has not been free of difficulty. Not just here, not just in this region but everywhere in the world for a long time. “We all know that there has been widespread acceptance of unequal treatment by people whose identity is considered to be inherently less worthy of protection and advancement than the folks who live in whatever the locality is. “When this story came out, instead of going into an immediate denial, the University did something that reflected the values you have been taught here. The University and the government promised to look into the charges, to do it quickly, to do it honestly, and most importantly, among all the world’s skeptics, to do it transparently. And if the charges were well founded, to take appropriate, remedial action promptly. Talk about living in denial: Clinton’s efforts to recast a serious investigation by the New York Times in a land already called out by Human Rights Watch for serial human rights violations as practices that occur “all across the world” is improper conduct for a former United States President. Was Bill Clinton correct in his assessment that the graduates would be proud of the eventual response to the labor abuses? In March of this year, the emirates banned Andrew Ross, a professor at NYU who had been critical of the exploitation of workers in Abu Dhabi, from traveling to the country. Last month, a group of more than 400 faculty at NYU published a devastating report on how students at NYU in Manhattan are being systematically fleeced by Sexton’s policies. Titled The Art of the Gouge, the report shows draconian hidden fees and tuition costs resulting in some students sleeping on park benches while the University continues to buy lavish homes for an elite group of faculty and staff. 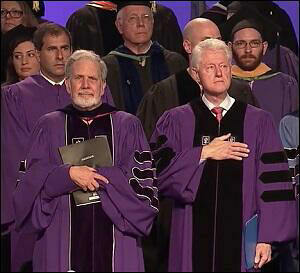 Bill Clinton also delivered the 2011 Commencement address for NYU at Yankee Stadium on May 18, 2011. No speaking fee has been disclosed by the Clintons for that address either. On Monday of this week, we emailed the Clinton Foundation asking if Bill Clinton was paid for his NYU Abu Dhabi commencement address and, if so, what the amount of the fee was. We indicated our deadline was this Wednesday at 5 p.m. No response was received. According to the May 21, 2015 disclosures by the Clinton Foundation, 20 colleges and universities have paid fees to the Clintons for speeches which they, in turn, have turned over to the Foundation. Many of those fees from institutions of higher education range from $100,000 to $250,000 per speech – an unconscionable “honorarium” when American students are currently saddled with crippling student loan debt totaling over $1.2 trillion. One university listed is the State University of New York at Albany, which paid Bill Clinton between $100,000 to $250,000 for a speech. SUNY Albany is a taxpayer funded university. Why would Bill Clinton charge a fee to a taxpayer funded university and not charge a fee to NYU Abu Dhabi? Since 2011, according to the Associated Press, Bill Clinton has been paid at least $1.2 million in speaking fees by other entities connected to the United Arab Emirates, including Abu Dhabi.